Origin: Seamm-Jasani is a part of the physical teachings of the Mmulargan Boabom. Description: Seamm-Jasani is an Art of active relaxation that is characterized by the use of slow and smooth coordinations in union with different breath techniques (or breath expansion: pranayama [sans. ], buy dbugs ring du gtong ba/དབུགས་རིང་དུ་གཏོང་བ།[tib.]). It also works the active and passive meditation as systems of physical and mental revitalization, obtaining great achievements for the health. Its movements are graceful, simple and expressive. Reference Reading (Books): “The Secret Art of Seamm – Jasani” (Book-Course that develops the basis of this Art). Name: Boabom, specifically Osseous Boabom. Meaning: Defense or inner energy, osseous strength. The “osseous” reference points to the nature and character of this Boabom form as being like the bone: light, strong and flexible. Origin: Osseous Boabom is part of the physical teachings of the Mmulargan Boabom. Description: Osseous Boabom is a defense Art that studies and developes the shrewdness of the movements, the dexterity, the self-control, the breathing (and the sound) as ways of developing the physical and psychic energy. 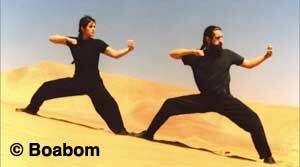 Boabom can be described as a dance casted in a fast, precise and extraordinary defense system, that form “waves” of energy (rlabs po che/རླབས་པོ་ཆེ།[tib.]). The movements are as part of a chain in which each new movement is linked to the previous, forming an infinite continuum of thousands of techniques: circular, straight, retracting, rising, etc. A Boabom class makes the student sweat, but without excessively tiring her or him through the repetition of a single technique. Instead, the student becomes enthusiastic about the movements, excitedly progressing from one to the next. In each class the student learns new movements, producing a curiosity and desire to continue and progress. Nevertheless, while it is an art that basically involves physical movement, its name also translates as “Internal Defense” (nang-srung/ནང་སྲུང།[tib.]) because it develops and intensifies the psychic energy of the student. 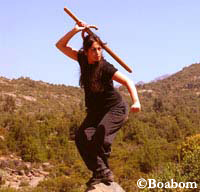 As much as it has been said, in its form of aplication as defense (because there is no contact or friction between the students), or in its final goal (the mind balance), Boabom is distinguished strongly from what is known as martial arts. Because of this, Boabom is also known as: “The Non-Defense Art”. Objectives: To meet and achieve self-confidence. To learn to be positive, strong and humble at the same time. In summary, Boabom increases and awakens the the energy or inner strengh in a direct way (prana[sans. ], pr’a-Na/པྲ་ན་[tib.]). Health: The general strengthening of health is evident in Boabom. This art is like a vitamin or a general revitalization that helps strengthen the student in all aspects. Requirements to learn: Health that allows medium excercise. It doesn’t require any previous knowledge. Implements: Boabom doesn’t use any implements, only the natural energy. Recomended age: To begin, from 3 to 6 years, with a special teaching. For 65 or more years there is a lighter form of Boabom, depending on each person. Books: “The Secret Art of Boabom”, which gives an introduction to these teachings. First, the mechanics of movement (Boabom technique). Third, the emanation (magnetism, self-confidence or mental strength). 1-Boabom technique of the reaction nerve-muscle. 2-Boabom Breathing Technique of the Inner Power. 3-Deep stretching by cycles. Elongation. 4-Boabom technique for development of fast vision. 5-General strengthening: cervical, thoracic, abdominal, etc. 6-Boabom hand and foot techniques: straight, retractile, spiral, round, oval and angular. 7-Boabom step technique: high-medium-low, linear, circular, rotating, etc. 8-Boabom technique of the reaction Forms, taken and not-taken. 10-Application of open and free movement along the projection of the internal energy. This presents a unique and spontaneous dance in its classic way: lonely, open, multi-standard of the legendary Art of Boabom. Description: Yaanbao is the study of inertia. Yaanbao is a branch of Boabom, an Art of exercise and defense that develops its movements through different elements (lag cha/ལག་ཆ།[tib]),which take shapes such as: medium, long and short staffs, swords, etc. Each element is studied in cycles, which allows the student to master them in order of complexity. Yaanbao also prepares the student with bare hands to face and balance her or his defense against another student using various elements. Requirement to learn: Health compatible with medium excercise.Completion of the first Boabom level (5 or 6 months) and then continuing simultaneous advance in Osseous Boabom and Yaanbao.